The B-737-200c model depicted in this package is a highly detailed replica of its real-life counterpart. The model was created by using high quality digital photos, plans sourced directly from Boeing and many, many countless hours of testing, revising and testing again… I thoroughly enjoyed flying the Milviz 737-200c and highly recommend it. I felt that the overall look and feel of the aircraft were realistic and that the developers found a good balance between complexity and usability making it a great fit for every level of pilot, and also very importantly lots of fun to fly. 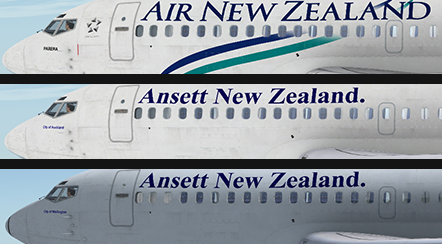 Jon Murchison has released a few lovely looking repaints of the Milviz 737-200 over the last week or so, one in the Pacific Wave livery as worn by the current but outgoing 737-300’s in Air New Zealands fleet, and two in the Ansett livery. Very nicely done, and a great model to boot.